Do you pay employees by the hour? Then you need a time clock. What kind? Biased as I am, I believe you should use an online time clock for your business, not an old fashioned machine, or PC software. In this guide, I'll try to explain what to look for and why. Typically, choosing an employee time clock is a task for small business owners, human resources managers, payroll providers, PEO firms, or staffing agencies. Whatever your role, I hope it helps you in your search. Whether you have one employee, thousands over many locations, or anything in-between. Why use a time clock at all? It promotes fairness. Using a machine or software takes away any personal bias. Nobody has any special advantages or favors. Everyone is treated equally. It keeps employees honest. If an employee clocks in late, then they are late. An indisputable record is now etched on their timesheet to prove it. There may be excuses, but that's a completely different story. It lets you know if employees are working or not. Simply look at their time cards. Are they clocked in? Some systems have status reports showing the employee's location and what job they are working on. It reduces administrative costs. This one can vary depending on what kind of time clock. But even a basic clock that prints on a paper time card is more efficient than writing it down. And if the clock also calculates the hours, the potential time savings can be significant. It helps reduce payroll errors. With a completed timesheet, and assuming the approval of both the employee and supervisor, payroll can safely be run. And if the time clock allows data transfer, then human error will be reduced if not eliminated. It helps keep you compliant. This is straight out of the Fair Labor Standards Act (FLSA) guidelines: "The FLSA requires employers to keep records on wages, hours, and other items, as specified in DOL recordkeeping regulations." In full disclosure, time clocks are not required by the FLSA, but do you know a better way? Mechanical time clocks: The most traditional. These use a mechanical type wheel that hammers through an ink ribbon onto a time card. Making a loud, "ka chunk" sound. As you might guess, it's where the term "punch" clock came from. You still see them in manufacturing and construction. Electronic time clocks: The next generation. Instead of a mechanical punch, electronic clocks print using a dot-matrix printer. They're much quieter and lighter. Making them a better choice for offices, etc. Side printing time clocks: These clocks have a slot on the side where time cards (or documents) are inserted. They require the user to align the card manually on the correct line of their time card. Not the most user friendly, but works. Top loading time clocks: These clocks automatically feed the time card from the top. Sort of like a toaster. Eliminating the print errors found on side printers. They can also print in two colors. Black for regular time, and red for exceptions such as clocking in late. Calculating time clocks: These clocks take top loading a step further. Instead of imprinting just the time and date on a time card, they will record the elapsed time between the in and out punches. They also provide a column showing the running total through the date range. If you have ever tried adding hours manually, then you know this is a huge convenience. First understand there is really no price advantage of using a time clock machine. Sure, there are no monthly fees, but they can still cost a few hundred dollars for a decent one. The true advantage is when you have no computer or network available, but do have AC power. In that case, you at least have something to record your employee hours. With the rise of home computers, so did software. Time clock software connects Windows PCs with data collection terminals using a direct cable, network cable, or even Wi-Fi. Sometimes known as a client server model, the software becomes the server, and other computers (and terminals) become clients. Limited to Windows. Few support Mac. If your business has only one location, and you like the idea of using a single PC, this may be an option for you. Keep in mind you will need to be comfortable with installing and maintaining software on your PC. Also keep in mind that most manufacturers are moving away from this model in favor of online. And, like time clock machines, there really isn't any cost advantages, in fact you could spend more. I mention this category because of what you may be lead to believe. 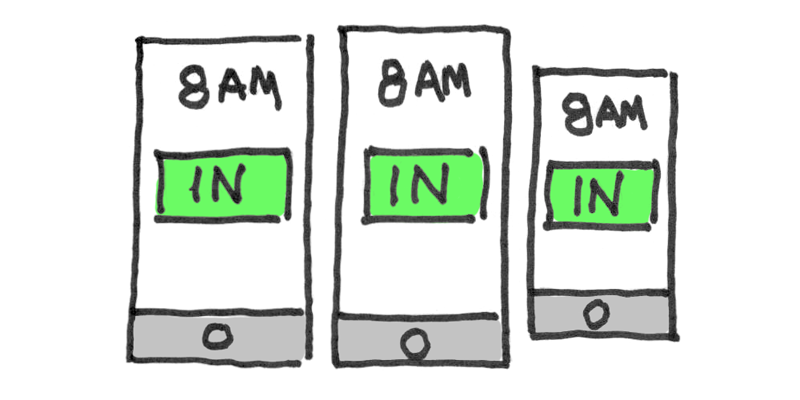 Since we all use our phones and tablets a lot more, it makes sense we can turn them into an employee time clock. Which we can. The trick is how data is handled on the back end. To be clear, a time clock app is simply a data collection device of an online time clock system. It's not just something you download from the App Store or Google Play. To be a complete system, you will need access to a manager interface that allows you to track all your employee hours. And that, my friend, is an online time clock, not just an app. If you like the idea of employees punching with their phones or tablets, then look for a good online time clock system first. One that just happens to have the option of using a time clock app. With the growth of the internet, comes online software. Without trying to be confusing, an online time clock is basically the same as time clock software. The difference, of course, is one works online and one doesn't. But that difference is huge. Why? Because the technology used allows the software to be accessed from any device, from any location. And fast. Not just from your local network. It may worth knowing that online software is developed differently too. It's coded to be optimized for the web. In comparison, legacy software (time clock software) may work great on a PC, but it doesn't translate well online. To do that requires workarounds such as plugins such as Silverlight, etc. Yes, it works, but it's not ideal, and frankly a little slow. Multiple data collection options: Not every business situation is the same. Not all employees are the same. HOW employees punch time is really a matter of works best for your needs. Maybe you want them to punch from a clock on the wall. Maybe you want them to use their computers. Or maybe you really like the idea of letting them use their phones. You should have that choice. For example, a cleaning company may have employees at remote location, so clocking in by telephone is a good choice. A medical office may have employees that work only one or two locations, so clocking in from an office computer, or a wall-mounted tablet is a good choice. It all depends. Multiple administrators and supervisors: It's not practical for someone to supervise 50 people. It's much more efficient to supervise smaller groups. A good online system will allow this. A good system will also allow you to assign administrators that can access data. Maybe you have an accountant or payroll provider. They should have a way to access the data on their own. Data exporting: For efficiency and to reduce errors, a good online system should allow you to export (or transfer) your payroll data. That way, you will not have to re-key the hours while preparing payroll. IP security: A frequently asked question is how to prevent employees from clocking from home. 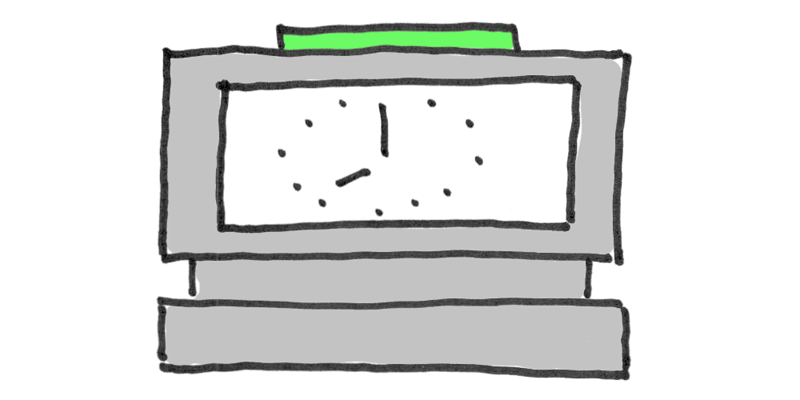 To do that, an online system should allow you to authorize where employees can clock from. Using IP addresses, the system should be able to limit employees based on what IP network they are connected to. If they are at work, they can clock in. If they are not, then they can't. Geolocation tracking: Know exactly where your employees were when they clocked in or out. With an accuracy, down to a few meters. It's good to know if employees are where they say they are. This feature could not happen without access to services such as Google Maps. Job tracking: Employees are hired to fill a position, a job if you will. But it's possible they may be assigned to different jobs during the week, or even each day. A good online system will allow those employees to track how many hours they worked for each job. Benefit hour tracking and accrual: Many companies give their employees paid time off hours. And sometimes they will allow the employee to accrue these hours over time (or by number of hours worked). A good system allows administrators and supervisors to enter these hours on an employee's timesheet. Employee self-service: If an employee wants to ask from time off, or needs a mistake corrected on their timesheet, they must go to their supervisor. As easy as that might sound, it's time consuming for both, not to mention costly for the business. A good online system allows employees to leave comments and requests their supervisor can read later. Comments that should be added to their timesheet as a permanent record. And to make it even more efficient, the timesheet should also be a place where employees can view any accrued time off they have coming. Custom payroll policies: Every business follows their own pattern for payroll. Some pay employees each week, some pay every other week, some still pay twice a month. Whatever your pattern, the system should adapt to it. And to be even more useful, it should easily let you go back in history to view past pay periods quickly without any hesitation. Custom overtime policies: Not that you need reminding, but it's a federal law here in the United States. All nonexempt employees are entitled to receive 1.5 time their regular hourly rate for any hours worked over 40 hours during a workweek. States may have their own rules too. Good systems will provide these settings so you can be compliant to the laws. Custom rounding rules: It all depends on how you like to pay your employees. Do you pay them to the nearest quarter hour? The nearest 10th of an hour? Or to the exact minute? A good system will display the exact time of the punches, but will round the total hours based on the rules you choose. Custom shift rules: What time does the shift start? When is a punch late? 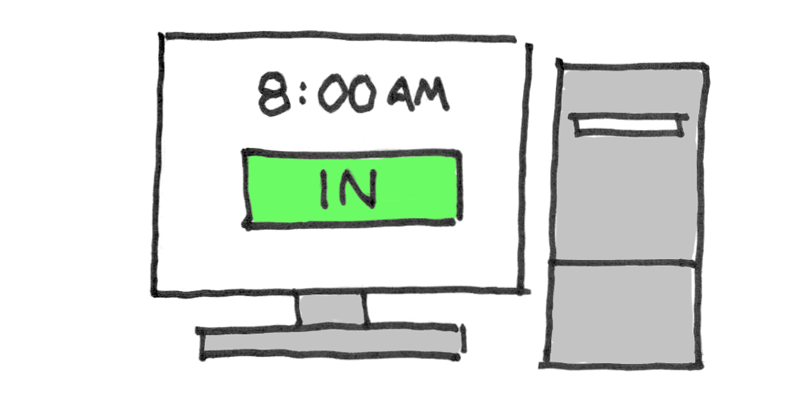 Do you want to allow employees to clock in a few minutes early? Shift rules will help determine if the employee starts late, or leaves too early. Revision zones: Along with shift rules, revision zones help define your shift policy. What they do essentially is round the punch to the designated start time (or end time) of the shift. For example. 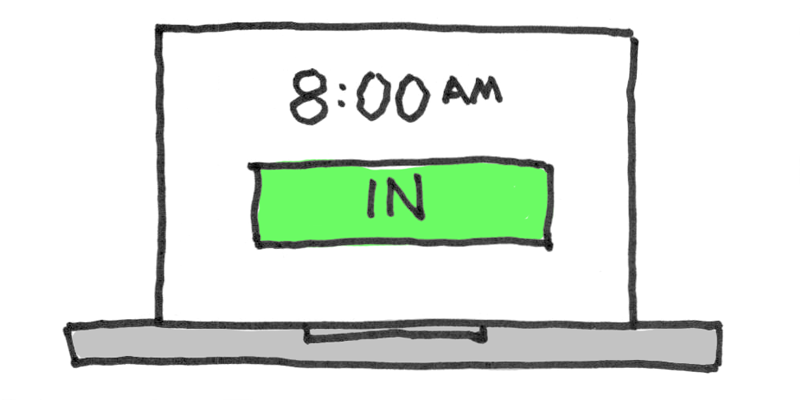 You could allow employees to clock in anytime between 7:30 AM and 8:05 AM for a shift that starts at 8:00 AM. When they do, the time of the punch will be rounded to 8:00 AM. Automatic lunch deduction: If employees have a lunch break in the middle of their work day, using the automatic lunch deduction setting can accommodate unpaid lunch breaks more efficiently. For example, it can be set to deduct one hour from their work day, if they work at least 5 hours during that day. The same as legacy software: Except for the no monthly fee part. Access from anywhere: Gone is the need for servers, IT staff, special WAN networking, or the like. All you need is a device with a browser. The system becomes an instant wide area network for your payroll hours. Access data from your office, at home, or while traveling. Doesn't make any difference.. Clock in from anywhere: Follows the same logic. If you have multiple locations, there is no solution more efficient than an online system. Employees can punch from any location you authorize. And when they do, you'll know exactly where they are.. The need for speed: The more we use the internet, the more impatient we become. We want what we are searching for, and we want it now. Don't make me load any special software or plugins, just give me the data! Data should be provided instantly and accessed easily..
No software to install: Enterprise systems using the old server client model typically use client software to access data. Instead, online is optimized for web browsers. No software needs to be installed..
Lower costs: Going online means, you don't have to purchase servers, IT staff, or even hardware. What you pay for is the cost of each user. So instead of investing hundreds or thousands of dollars, you pay a fraction month to month. Your initial cost is lower, and your overall is also lower..
As a quick comparison, these days, a decent calculating time clock costs about $400 not counting the replacement ribbon and cards. It has a one year warranty. If you had 10 employees using an online system, your cost is less than $400 over a two-year period. Would your clock last over 2 years? Maybe. But it wouldn't come close to the advantages of an online system. It's still a business expense: Any fees you pay for your service is a business expense. Just like the fees you pay your payroll provider. Write it off at the end of the year..
You don't own it: Why is this an advantage? Because there is nothing to break, nothing to maintain, nothing to have serviced, and nothing that requires support fees. The exception is if you purchase a wall mounted time clock that acts as a data collection device. An internet connection is required: These days, this is fast becoming a non-issue. However, there are still circumstances where this would be a deal breaker. Yes, there are still places that don't have internetâ€¦ I think. You don't own it: Why is this a disadvantage when it's already an advantage? Because we know some of you. You want to own it. You want to know you can see, touch, and hear it go "ka chunk". That's fine. But don't you already outsource something? Like maybe your payroll? Just a thought. Not every online system is equal: This is very true. But all other time clocks are not equal either. 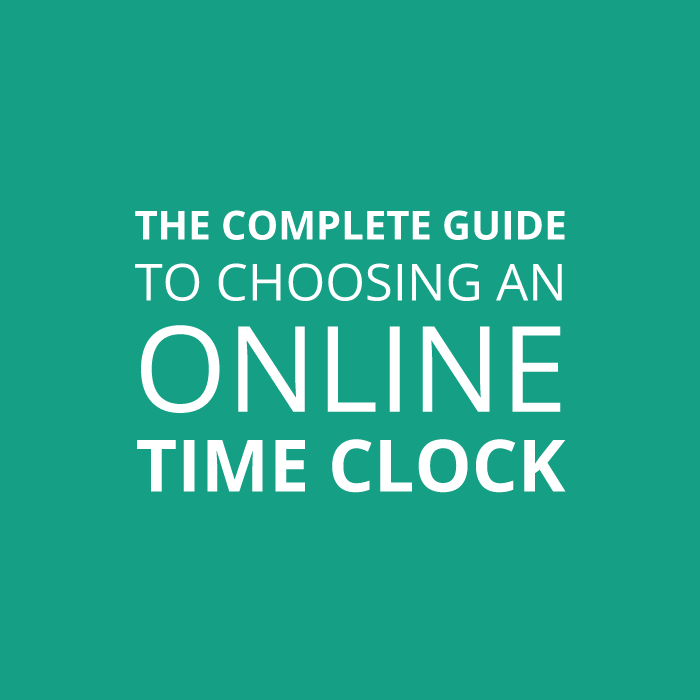 If the features we listed are important to you, then consider trying Webtimeclock. If you really need to track employee hours for payroll, then use an online time clock. You will instantly have access to the advantages and benefits it offers. Namely, you can access your data from anywhere and on any device. You will also enjoy cost savings both in upfront costs, and maintenance costs over time. Incidentally, online systems really have no set optimum number of employees. So, it doesn't matter if you only have one employee, or if you have thousands over many locations. Because of their nature, they (should) adapt to your needs. You may want to consult with their support to be sure. The internet really has changed the way we do things. Mostly for the better. Outsourcing your time and attendance will only help your company be more efficient and competitive. Give it a try (most systems even come with a free trial). I wish you much success.